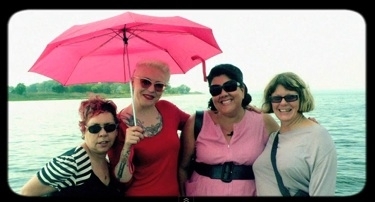 As part of their research for The FeMUSEum, the Musing Muses (Amy Lamé, Bird la Bird, Carmelita Tropicana and Lois Weaver) went to the Jersey Shore for an away day. They indulged in a lovely lunch provided by Amy's Mom, Nick. Then they sat around her dining room table making plans for the FeMUSEum which will cut her lovely pink ribbons at the Trashing Performance Public Programme in London on 28 October. When they finished they went for foot long hotdogs down at Keansburg, the local seaside attraction. Here's the evidence of some very serious research.